Growing up in Kansas during the depression wasn't easy, about the only things one could count on was family, friends, and faith. The Ehlers family didn't have a lot of personal possessions, but they learned to get by, trusting in each other and the faith that held them together. Young Walt Ehlers decided to join the Army on October 4, 1940. His older brother Roland decided to join with him, and so it was that both men found themselves training for war in the Pacific when Pearl Harbor was attacked. Early in 1942 Walter and Roland shipped out with their division but not to the Pacific. Instead, they were assigned to combat in North Africa. From North Africa to Sicily, through 3 major campaigns over almost 4 years, the two brothers remained together. Then, during the fighting in Sicily, Roland was wounded and sent back to Africa for treatment. Walter continued to serve until his unit was sent to England to train for a major offensive. While preparing for the invasion of Europe, Roland rejoined the unit and his brother Walter, though it was to be a short-lived reunion. As the men of the 1st Division were training for D-Day, the company commander called Roland and Walter in to meet with him. He told them that for the first time, they would be separated and placed in different units. He told the young soldiers there was only a fifty percent chance that they would survive the pending invasion, and that Walter would be transferred to Company L as a squad leader. Walter went to his new unit and worked hard to prepare his men for the coming invasion. He and Roland managed to get together one last time in Southampton to talk about their family and wish each other luck. They both knew they would be participating in the impending landing. "We'll meet up on the beach," they promised, then went their separate ways to join 170,000 other soldiers as they loaded the ships that would take them across the channel to attack Normandy. The First Division landed at Omaha beach. Walter's craft hit a sandbar and the men had to jump into water over their head to make their way to the beach. A few hundred yards farther down the beach, Roland's Company was also landing. There was no time to worry about each other, each brother having responsibilities of their own to attend. Walter began to lead his squad off the beach. They were taking fire from enemy bunkers on the bluffs overlooking the beach, and Walter knew the only chance of survival was to keep his men together and attack the high ground. He led them by his example. After a 6-hour battle to reach the hills, they finally broke through the German defenses. 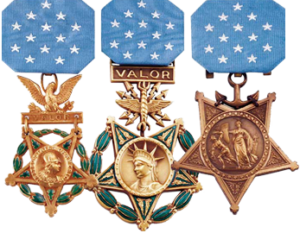 Walt's courage and leadership that day saved his platoon and earned him the Bronze Star Medal. Then, as night fell, he went looking for Roland. In the darkness and devastation of D-Day at Omaha, it was difficult to find anyone, but at last Walter found Roland's Platoon Sergeant. He asked about Roland, and was told only that his brother was "Missing In Action". Worried, Staff Sergeant Walter Ehlers returned to his squad and the fighting that still lay ahead. In the days that followed, the fighting moved inland as the brave soldiers who had landed at Normandy worked to dislodge the enemy from their fortifications among the hedgerows, dense thickets and rows of vegetation that separated farms across the countryside. The fighting was bitter, dangerous, and very costly. 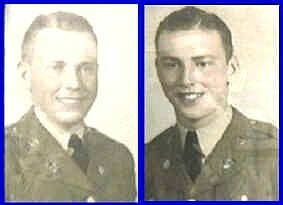 By June 9th Walt Ehlers' squad was far ahead of most other Allied troops, and Sgt. Ehlers himself was at the head of his men. In an early morning attack, his company was pinned down in an open field by fire from machine-gun nests and two mortar pits. Without orders Sgt. Ehlers jumped to his feet and headed towards the first machine-gun nest. Suddenly a patrol of 4 enemies confronted him. Quickly the Sergeant killed all four, then proceeded to advance on and single-handedly destroy the machine-gun nest and its crew of eight enemies. He called to his squad to move up and join him as he turned his attention towards the mortar pits that threatened to destroy the company. Before continuing the advance he gave an unusual order...."Fix bayonets". Later he recounted, "It had a psychological effect on the Germans. They looked horrified and started running." Ehlers knocked out that position, then his men started taking fire from yet another machine-gun nest. Again, at a point ahead of everyone else, Sergeant Ehlers advanced on and single-handedly knocked out that enemy position. By the following day, Sergeant Ehlers and his platoon were so far ahead of everyone else they were literally surrounded by Germans. The platoon was ordered to withdraw, and Sergeant Ehlers' squad assumed the responsibility of covering the withdrawal of the rest of the unit. 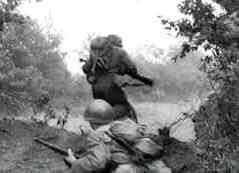 Sergeant Ehlers and his BAR (Browning Automatic Rifle) man stood back to back to draw enemy fire upon themselves and rain effective fire against the enemy to cover the safe withdrawal of the platoon. First, the BAR man was shot and wounded, then a rifle round struck Sergeant Ehlers in the back. Ehlers turned quickly and saw the sniper that had wounded him and was able to kill the enemy soldier. Then, despite his own wound, he carried the stricken BAR man from the battlefield before returning to recover the badly needed BAR. The medics began treating Sergeant Ehlers' wound and quickly learned that the bullet had hit him in the side, glanced off a rib, and exited from his pack. Inside that pack was a picture of Walter and Roland Ehlers' mother, and the bullet had torn the edge of the folder it was in. Sergeant Ehlers refused to be evacuated. His wounds treated and bandaged, he returned to his squad. He later said he didn't want any of his men to be hurt or killed, and he felt his obligation was to be there to lead and protect them. By July, after a month of fighting, Sergeant Ehler's squad was holed up in an abandoned farmhouse when he received an unusual visitor. It was the company commander of his brother Roland's company. He came bearing sad news; Roland had died at Omaha beach. As his landing craft approached a mortar round had hit the ramp instantly killing the older brother. Walter was devastated. He saluted the officer and said, "Okay", then found a place of privacy to weep unashamedly. "Liberty is worth fighting for, and sometimes worth dying for."